Many homes have porcelain on steel and porcelain on cast iron plumbing fixtures. This manufacturing technique is commonly used for bathtubs, laundry sinks and tubs, kitchen sinks and bathroom basins. Using either steel or cast iron as a base for the porcelain covering provides a stronger and more durable product than molded porcelain on its own. It is highly unusual for a porcelain fixture with a steel or cast iron base to crack and allow water to leak through it. New porcelain is very attractive because its surface gleams and glistens. The finish has a depth to it, which enhances its appearance. Overtime porcelain will lose some if not all of its luster, primarily due to the use of abrasive cleaning products. Chips may appear because heavy objects fell on the porcelain fixture. Chipping is especially common around the edges of kitchen sinks, as shown in Figure 1, because they are constantly being hit with metal pots and pans and bathroom basins that have heavy objects accidently dropped into them. Porcelain touch up kits are available at most of the big box home improvement centers and building supply stores. These are bottles of colored enamel that will supposedly match the color of the porcelain. Note: While you may think that white is white; white, as defined by porcelain fixture manufacturers, is available in at least 10 different shades. If you don’t know the manufacture of your fixture the odds of getting the right white is truly against you. There is a debate on whether using the wrong white for a repair looks worse than the original chip. Figure 2 shows a repair on the front edge of a porcelain on steel bathroom basin. Although both the basin and the repair are white the repair stands out. Besides the problem of matching the color these repairs seldom last very long. It may be wiser, especially in the case of a bathroom basin to replace the basin rather than trying to cover up chips. Most metropolitan areas will have many professional plumbing fixture repair services available, that will do the necessary porcelain repairs right in your home and you do not have to remove the fixture. Repairing chips will usually cost between $75 and $125 depending on the number of fixtures needing repair and the quantity of chips on the fixtures. Let me start off by saying that the plumbing fixture refinishing and/or re-glazing industry does everything it can to confuse the consumer. First, in fact I have been unable to identify any company that actually re-glazes porcelain on steel or porcelain on cast iron. The problem is one of economics. To truly re-glaze a plumbing fixture would require that the fixture be removed and sent to a factory for sand-blasted to remove all of the old porcelain glaze. The cast iron or steel would then have to be prepared to accept the new porcelain. The fixture would then be dipped in the new porcelain glaze and fired in a 1500 degree kiln. The economics are just not justifiable, as it would be far less expensive to find a new plumbing fixture that meets your requirements. However, if there is a company that does this type of work reading this article, please contact me and I will be pleased to adjust the article accordingly. What I have been able to learn that there are a number of techniques and products used to refinish porcelain. 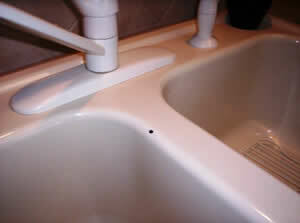 These techniques and products are done without removal of the fixture which is the basic key to their success, especially where bathtubs are concerned. It is usually impossible to remove a bathtub without damaging the surrounding wall areas which makes replacement a major expense. Hence, the in-home or in-hotel refinishing industry has grown dramatically over the last 10 to 20 years. With it has come a new array of finishes that dry faster, are harder and more durable and less toxic. As I previously mentioned there are a host of different materials that require different application techniques available to refinish porcelain on cast iron or porcelain on steel plumbing fixtures. The basic material is a paint or epoxy which you can purchase at any of the big box home improvement centers or building supply retailers. These materials or products generally do not last due to problems with adhesion to the current finish. They will chip easier than the original porcelain and have little if any resistance to any type of abrasion which will result in fine scratches and dulling of the finish in a very short period of time after application. At the opposite end of the scale are the processes that use a finished coat of Acrylic or Urethane based product that have been specifically designed for semi-continuous water submersion, a high resistance to impact and the retention of the finish. It would appear that the most important aspects, when refinishing a plumbing fixture, be it a bathtub, kitchen sink, bathroom basin or laundry tub is the company that you have contracted with coupled with the materials that they use. Note: The best materials if applied incorrectly have little if any value. References: Ask for 3 references in your area. Call the people and talk to them and ask if it would be possible to see the finished job and verify the answers to the next X questions with the references. How long will the job take: This includes the time that the workmen will be in your home and the length of time after they leave before you can use the plumbing fixture. Smell: Some of the finishes used have very strong odors, some maybe somewhat toxic. If you or anyone else in the family has any respiratory problems such as asthma the odor could mean leaving your home for a few days. Guarantee: How long and what are the terms of the guarantee. Anything less than complete satisfaction for 5 years is really not acceptable. Color Match: Will they guarantee a color and gloss match with other fixtures in the same room. There are many different color shades and gloss factors used by manufacturers. If the toilet and the bathtub are side by side, two different shades of white become quite noticeable. 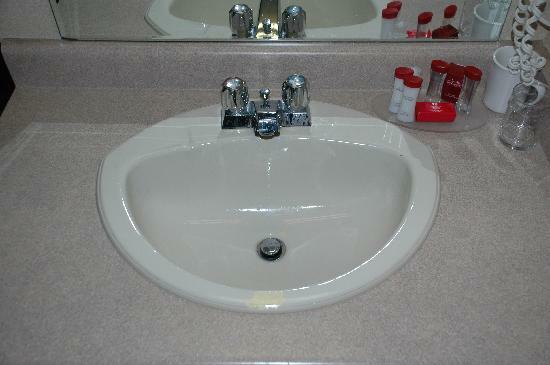 I have seen many bathtubs and basins that have been refinished and although the finished product is an amazing improvement over the chips, scratches and overall appearance prior to refinishing it is not the same as it was when it was original. None of the refinishing coatings truly duplicate a porcelain finish. Only you can decide if the finished product will be acceptable to you.